Also out this week, rounding off a glut of new TF releases I had a hand in (to some extent or other), is issue #13 of Titan’s Transformers (UK) magazine. Contained therein, is the final, tumultuous part of ‘Twilight’s Last Gleaming,’ our alternate take on what happened after the movie credits rolled. So big it needed an extra story page to tell (the originated page count per issue stays at 11 from now onwards), TWG5 sees not one but two epic showdowns: Prime versus Megatron (the rematch!) and Ratchet/Ironhide versus a whole platoon of Decepticon drones (under the command of Bonecrusher). The odds are heavily stacked against the Autobots in both head-to-heads. Unless, that is, Mikeala can come up trumps. What exactly was that she found deep within the old Sector 7 base? All is revealed. ‘Twilight’s Last Gleaming pt5’ is written by me with art by Marcelo Matere. 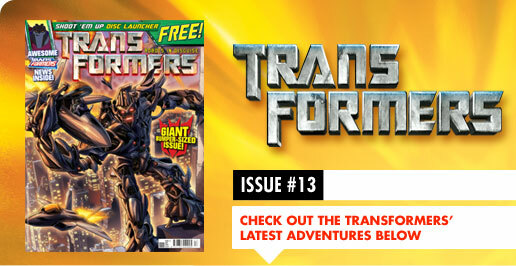 And… there’s a whole lot more in TF-UK #13. For a start it’s bumper-sized, sports an all-new art cover by Gary Erskine, comes with a designated Transformers Animated pull-out section (with its own BIG news) and has a FREE disc launcher to boot! Not to be missed! TF-UK is out (in the UK only) on Thursday June 19th! This entry was posted on Wednesday, June 18th, 2008 at 7:05 am and is filed under Uncategorized. You can follow any responses to this entry through the RSS 2.0 feed. You can leave a response, or trackback from your own site. Poor Megs never gets much luck in this universe :p Good strip all in all, just one question is the new BW story starting next issue completely new, as in UK originated? Or is it The Ascending? Hey Matt, it’s IDW BW material I’m assuming. So ‘The Ascending’ is the likely candidate. Simon, absolutely AWESOME conclusion to T’sLG. Not just hyperbole, I really can’t wait to see what you’re going to do with Aftermath. This really is the natural successor to the TF of Marvel UK’s hayday. Absolutely stellar stuff! It makes my heart glow with nostalgic joy to see the UK strip running to 11 pages again for the first time since back in the day. 11 pages!!! I’m 10 years old again.